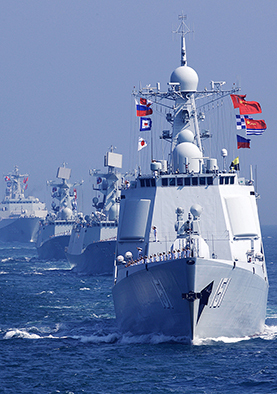 China has been increasingly aggressive in the strategically vital South China Sea, establishing naval and air bases — and installing weapons — on islands it is constructing atop environmentally sensitive reefs. Tensions in the vast region, heavily patrolled by the U.S. Navy, have risen sharply in recent months. Surrounding nations, including the Philippines, a major U.S. ally, want access to the sea's wealth of natural resources — primarily oil, natural gas and fisheries — and its busy commercial shipping lanes. Responding to China, former President Barack Obama sought to shift more U.S. military resources to the region, but critics say his “pivot” was inadequate. President Trump's nominee for secretary of State, former Exxon Mobil CEO Rex Tillerson, told Congress the United States should forcefully confront China in the South China Sea and possibly deny it access to the islands it has built. Meanwhile, the Philippines' mercurial new president has voiced hostility toward the United States and a desire for closer relations with China, injecting further uncertainty into the region.